The P-800 Oniks (also known as the SS-N-26 Yakhont) is a supersonic anti-ship cruise missile that entered service in 1999 and is a replacement for the P-270 Moskit (SS-N-22 Sunburn) and, possibly, the P-700 Granit (SS-N-19 Shipwreck) anti-ship cruise missiles. The BrahMos, a joint a supersonic stealth anti-ship cruise missile developed jointly by Russia and India, is also based on the P-800 Oniks. The P-800 is capable of achieving speeds that exceed 2.5 times the speed of sound due to its aerodynamic shape, which makes it nearly impossible to counter. The missile’s detectability is further reduced by the fact that it is covered with radar absorbent material. The AK-130 twin-barreled 130 mm naval artillery system entered service in 1985 and remains one of the most powerful gun systems in the world. The AK-130 has a control system that comprises of a laser designator, a low light TV, an ESM system, and a dual-band radar. The system is capable of engaging naval, aerial, and land targets, and has a range of up to 75 km. The barrels have a rate of fire of 20-40 rounds per minute (each) and feature an integrated liquid cooling system. 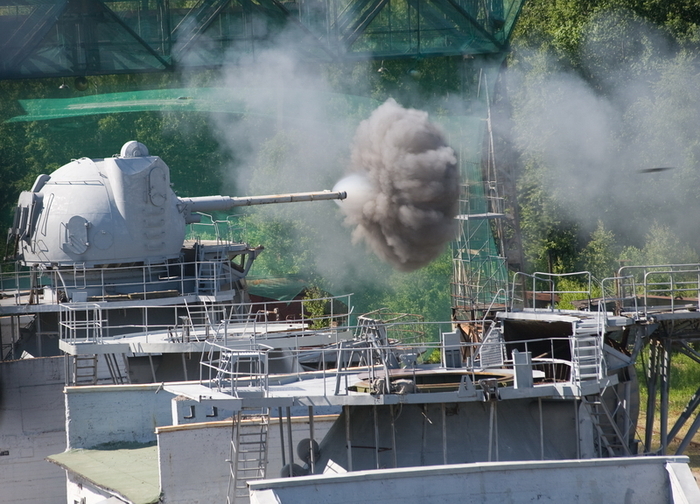 The entire system can be mounted on any Russian medium or large surface warship. 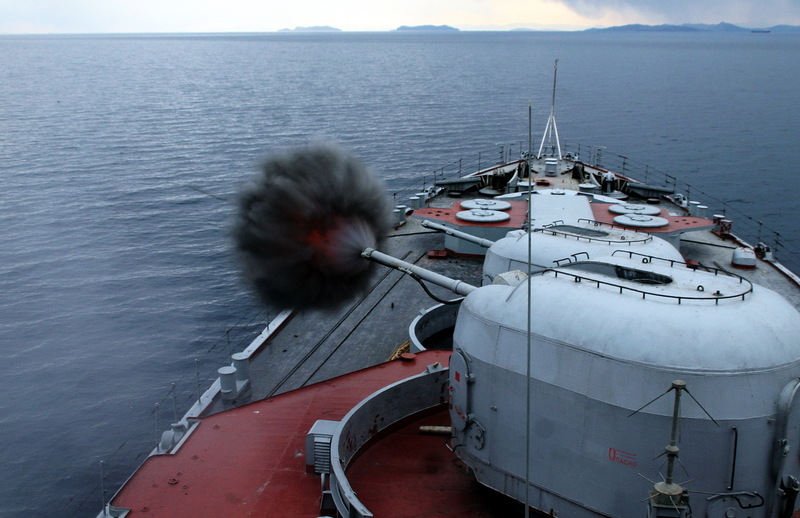 In service with several Russian warships since 1978, the AK-100 is a 100 mm automatic water-cooled naval artillery system that is designed to engage naval, aerial, and land targets. The AK-100 can accept various ammunition, including ammunition with proximity fuzes, high explosive ammunition, and armor piercing ammunition. 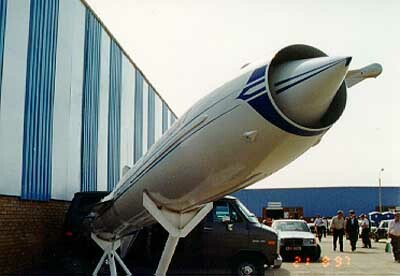 The system can also engage anti-ship missiles. The AK-100 has a range of over 20 km, and has a firing rate of 30-50 rounds per minute. The AK-100 has an elevation of -10 / +85 degrees and weighs roughly 35 tons. The AK-100 can be manually controlled, or via a control system that comprises of an electronic TV targeting system and a computer. The firing rate is adjustable from single shot to fully automatic.